Very nice, looking forward to what the community brings to the table! I think it'd be great if you'd allow at least some of this capability within the race generator vs xml modding. Assign a total point value to home planet value/colony ship/scout/etc and allow the player to modify it in game. Players have a mod manager that allows multiple mods to be loaded at the same time with an option to define which order mods are loaded in. Since mods would theoretically (I hope) just be the bare bones of the mods themselves & define for themselves how they are to treat the original xml, almost no additional validation need be performed above the existing validation already in place. Legit example reason to continue & ignore: It's not uncommon for modders to build off another mod. Take one mod that does a bunch of stuff & add two different forks that add different sorts of things to the original making the duplicates irrelevant. Yes, the names could have different suffixes & they wouldn't need to build off it so much as require it for their built off forks if the suggested append type <diffmethod> exists, but it's only an example ^& there could be other less obvious ones. Can you explain where the conflict is? I haven't tried modding GCIII yet, but I don't see why this modded race which uses the Terran tree wouldn't just use a modded Terran tree if you created one. 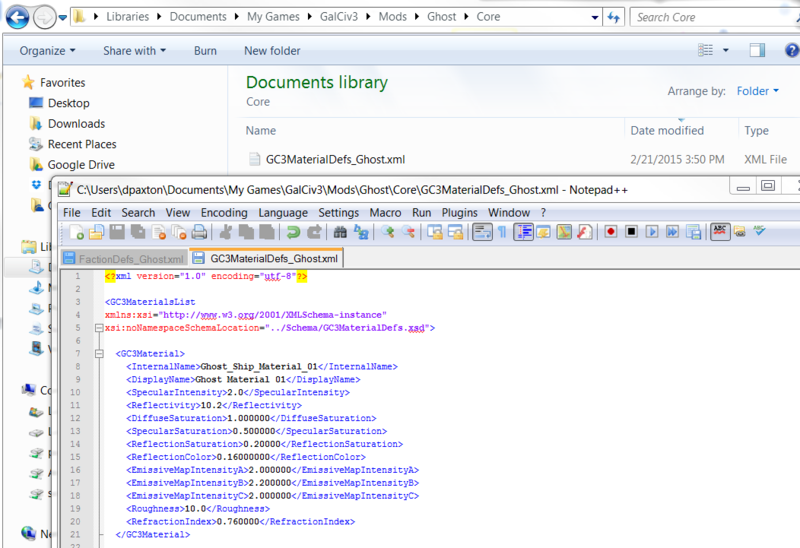 @Stardock: Do custom raced created with the in-game editor create .xml files like this one so you can start a race in the editor and then go in an mod it? I'm really liking the modding options. It is fun to do just like playing the game, it makes it feel personalized. • mod2 removes the atarbase module stuff from tech trees & adds them in elsewhere along with new/different modules. Ahh, I see what you are talking about now. thanks for the clarification. Sure. But the point is that this is just one of many many crazy things that can be done with modding. And I picked a very simple one because I wanted a clear example. No matter what we provide in the custom race creator, there will always be another thing that could be added to it. The point of modding is that all of those options become available to you. Modding is better for things that are inherently difficult to balance. I don't want players to feel like they have to make a custom Terran faction with 3 colony ships or else they are playing with a disadvantage. Instead we leave that to mods where the understanding is that you can do unbalanced things if you want. For example, in my playing of the Ghosts last night I found out that they are overpowered. Since each of their initial colony ships start off with population they were starting with more population than any other factions (if they could get new colonies in a reasonable time frame). Population drives everything in GC3, so they became tech and production monsters right out of the gate. I fixed that by reducing their homeworld population from the normal 10 to 5. This accounted for the pop on the ship and also did a better job of reflecting that their homeworld is ruined. Will you provide support for standard bik files, so the average modder can add video or animated files? Bk2 files, so far I haven't been able to obtain a license for as a casual modder or individual, I think they only sell it to game developers. Thanks for reading either way. That is true (actually not in your example, but your point is valid). In general people shouldn't be modifying or deleting things from the base game if they want to be able to run multiple mods together. This is problematic in nearly every case. For example I have one mod that increases all the factions to start with 6000 credits, and another mod that adds a new faction. That new faction won't start with 6000 credits (because its creator didn't know you wanted to run with 6000 credits too, and the credits mod owner didn't know you wanted the new faction). Or I have a mod that removes the Drone Sentry System tech from the game and another that adds another Tech that requires Drone Sentry Systems. They aren't goign to work well together no matter what you do. In general, modifying and deleting base game objects is best for total conversion mods. Mods that you don't expect to run with other mods. That's not to say that you couldn't do it, just that compatibility issues are a risk. Some of these issues are addressed on our side. Using your example (which would be a common one) of adding new techs to the Terran tech tree you can do entirely without replacing a base file. Create a new file for your new techs and they will be incorporated into the tree, as well as new techs from any other mods. So we will do what we can on our side to make it easy and clean. I may not be understanding what you are asking for. This is essentially what it does. If it is a new filename then it does an Append of everything in it. If it is an existing filename then it replaces everything in the former file with this one. It doesn't happen on a per entry basis. Let's talk about why. It would be cool to have that on each entry. It wouldn't allow modders to do anything additional, and it wouldn't get rid of compatibility issues. But it would reduce compatibility issues by allowing modders to be more surgical with their changes. The nice thing about the existing system (load file A or file B ) is that the game itself is unaware of mods, we are handing mod assets at the file level. No code to parse these files and apply logic on each entry. The game is simply given a different view of the world when you have mods loaded or not. This also works when talk about scenarios and the campaign. Where they have a locked view of the world. For them mods don't exist but their own local changes do. So they are a special saved game state. So if you run a GC3 campaign game Paul can change it however he would like and thats exactly how it will play, regardless of what mods are in your mod directory. You could also make a special scenario with rules just for that scenario and not worry about compatibility. That isn't to say that being able to modify/delete at an entry level wouldn't be good. This is a first step. lets get it into mod makers hands and see where to go next. I'm all for this. It isn't in now and probably won't be in for Beta 5. But I would love to use Steam Workshop for this where you can find, install, uninstall, enable and disable all your mods in one place. We went to bink2 for performance reasons. We would have to write code to handle both, and we may even need to pay an additional licensing fee to do that. I'll ask the Rad Game guys to see if there is a way modders can make Bink2 movies for GC3. if they only do the things you state that is correct, but if they both do additional things & for some reason $player wanted to play with the additional things without caring that the second mod would have an unobtainable prerequ on one or more techs as a result of the first. Great to hear, going along with that train of an example, will a mod that includes a <InternalName>$example</InternalName> that already exists in the core files replace, merge, or error about duplicates with the original? I could see reasons why each might be desired, but I think replace would be the generally optimal option. 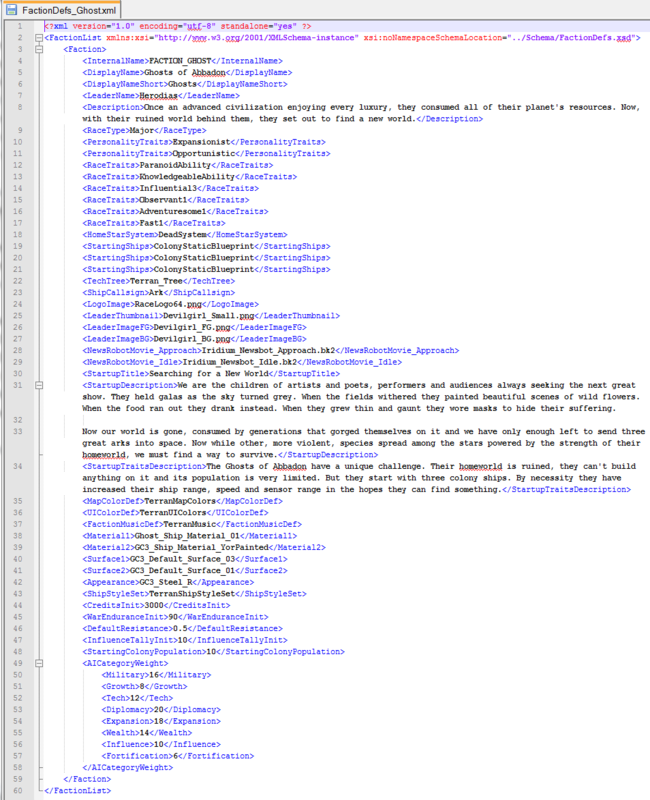 Generally I find that the xml files get included with a save game & making changes usually needs to restart. The only exception that I've noticed (accidentally at that) was mod some stuff> start a game> before saving alt-tab out & make more changes. 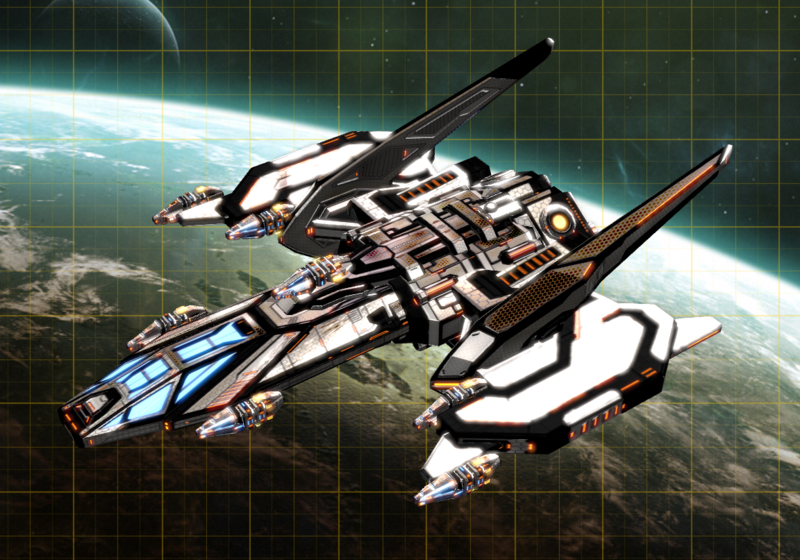 The specific thing I did this with was the bonus with some kind of ship component in 0.6x while in the designer . I don't know if that was a fluke or just an interesting loophole. xenonauts has an excellent example of this in action, essentially it's a simple launcher app that lets you see installed mods, make them active, set the load order, etc. it also doubles as a launcher that launches the game with mods as configured & the mods only come into play if you actually click the button to go into that part. something like that might(?) even be able to speed up whatever is happening between launching the game & Lord Kona/The drengin going away to give us the intro getting the video (if that's not doing some kind of beta debugging thingy?) by caching whats in memory to disk & just loading that if all the xml & game files have the same filetimes, maybe even reserve that to a default unchecked enable quickload option on that launcher since any problemsd caused by new drivers or something could be resolved by "try disable quickload &doing a standard load"
If this isn't stickied, this should be stickied. Great post. I want to translate the sentence of the game into Japanese. However, I do not want to update the xml file every version up. I want the other file to do a sentence playing a game. I did not know it. Thank you. When the minor civs get integrated will we be able to mod in our own? Any thoughts on a face/race picture creator? (similarly to how one can modify color/face/etc in FE)? but it doesn't effect the starting credits & might modify other stuff too . Part of what makes this particular example so difficult is that factiondefs.xml has doesn't use <effecttype>s that would get triggeredby gamestart a upresolution, or whatever, if it did, you might be able to do things like make a scenario where you have to galactically dominate or band together lesser factions with a goal or deposing a genocidal/opverly powerful $factionleader that does not actually trigger a victory condition & just makes that faction less super by giving it a new leader & modifying some of the existing stats. No. That system you refer to in FE is extensive (that's not a simple thing to do), and results pretty medicore end result (as I say that as the lead designer on FE, so I'm not knocking it). For GC3 we have opted for higher quality (and much easier tech) premade images. You can mix the character and background if you want,, and we will provide a sampling of hue shifted and tweaked versions for you to play with. Heres a question say i wanted to completely scrap the trade system and redesign it ( i havent looked at the xml's to see whats there for trade) how difficult would that be? a lot of that -could- be done. Interns trading excepted (sorta & more on that later). stuff. The first would (I think) make your mod incompatible with just about any mod that removes stuff from the same files (is shipcomponentdefs or various techdefs filessince you can't have the old trading stuff available while replacing it. Duplicate entries could block the bits off with bad prerequs if it overwrites instead of throwing an err for duplicates. -•.. Second you would want to add those resources to individual planet types(thereby potentially creating conflicts with other mods): The resource should probably get assigned to planet instead of faction. • second you start putting trade modules back in that require . •• if you wanted to fake internal trading, make a planetary improvement/project that requires one of those resources generated by the planet & have it mske a second resource.assigned to faction. ••• add one or more improvement /projectsthat use that second resource. potential problems abound. (my lack of playing with resources to determine their behaviors much being why they are almost all "I'm not sure but..." Type things. • I dont know if destroying an improvement/completing a project that requires a resource will return it/destroythe resource. • I dont know if/when resources mined ny star wars regenerate(if ever) & dont know if those generated by colonizing a planet will ever do the same if they do. • the number of new buildings might make the improvements list unwieldy since it doesn't get tabs like ship components (that alone would allow a lot more modding!). with that said.. If resources regenerate each turn & structures disable if the resource is ever missing (.i.e war/blockade /bombardment/destroyed building) it simply disables the improvement (as opposed to destroying it or keeping it active.... This could be an awful it of fun if done well& everything works. Well i would like to no how to make a 130, player mod with 1400 stars. I would like to limit the actual player selection to 50 players, so as to not make this overwhelming, and the rest opponents. I would like to limit the diplomacy screen to the first 50 players you meet who are not upset or hostile towards you. This would not affect espionage, and war. The players on this screen would change based on thrir relations towards you. If the next gamedon't have the research.ideas i came up with, i would like to be able to include them. I would like to change game mechanics for different races. Two good examples are i would like to make the krynn where after they have researched universal translator, and have advanced espionage on at least one race they can't research techs anymore, but now have to steal them. I would like to be able to remove the mechanic where the yor, and thalan don't have to rely on money, or approval. i would like to make some techs untradeable unstealable for some races , and not others. I would like to change the start settings where you start on a random starting planet. Different type, and class. If you start on a different type, then you can't colonise terran world, but you would have that advanced type of extreme planet instead. Terran colonization now would have to be a research option If you don't start out on terran worlds. I might include an option where you pick your tech paths for your race at the start of the game. To keep this from becoming inbalancing i would like to require you to pick certain types of paths in the beginning, so you at least have the minimum types. 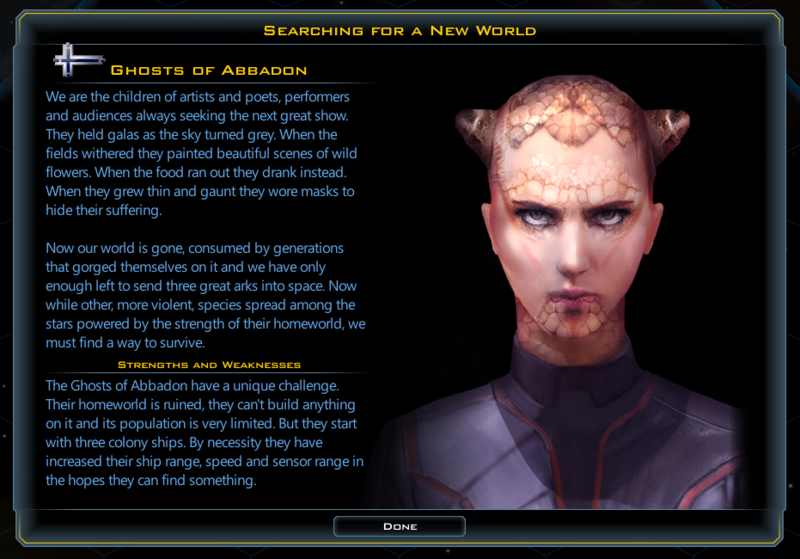 Different diplomacy, and research method options for different races would be nice. I would just like to pre-thank the wonderful person or persons who is going to make a Babylon 5 mod - it will be AMAZE-BALLZ!!!! Well i would like to no how to make a 130, player mod with 1400 stars. I would like to limit the actual player selection to 50 players, so as to not make this overwhelming, and the rest opponents. I would like to limit the diplomacy screen to the first 50 players you meet who are not upset or hostile towards you. This would not affect espionage, and ear. The players on this screen would change based on thrir relations towards you. If the next gamedon't have the research.ideas i came up with, i would like to be able to include them. I would like to change game mechanics for different races. Two good examples are i would like to make the krynn where after they have researched universal translator, and have advanced espionage on at least one race they can't research techs anymore, but now have to steal them. I would like to be able to remove the mechanic where the yor, and thalan don't hsve to rely on money, or approval. I would like to change the start settings where you start on a random starting planet. Different type, and class. If you start on a different type, then you can't colonise terran world, but you would have that advanced type instead. Terran colonization now eould have to be a research option. I might include an option where you pick your tech paths for your race at the start of the game. To keep this from becoming inbalancing i would like to require you to pick certain types of paths in the beginnin, so you at least have the minimum types. 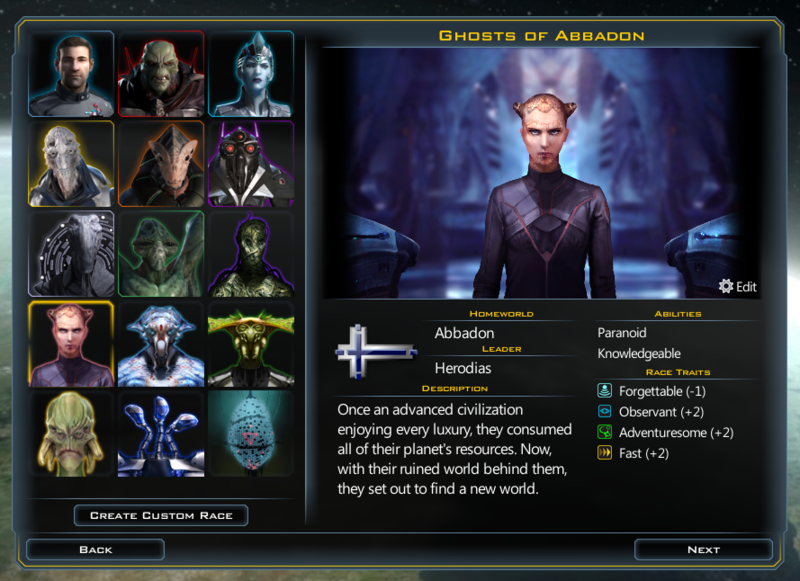 Different diplomacy, and research method options for different races would be nice. Mod the diplomacy screen as described, UI modding like that might not be possible & such a capability sounds like it would be the sort of thing you'd need access to the source code for at least some of it. you could probably do most of what you describe for tech tree changes using existing capabilities, but keep in mind the currently unimplimented espionage state. In fact, myself or another might have pointed that out in the thread where you asked it previously but could be wrong.